The Battle Proms are exciting yet informal open air picnic concerts to which people take their own food and picnic equipment and create their own space in the auditorium. The concerts have been staged since 1997 and provide an evening of exceptional entertainment that encompasses sublime music, stunningly choreographed aerial displays, thunderous cannon fire, dramatic cavalry displays and fantastic fireworks. 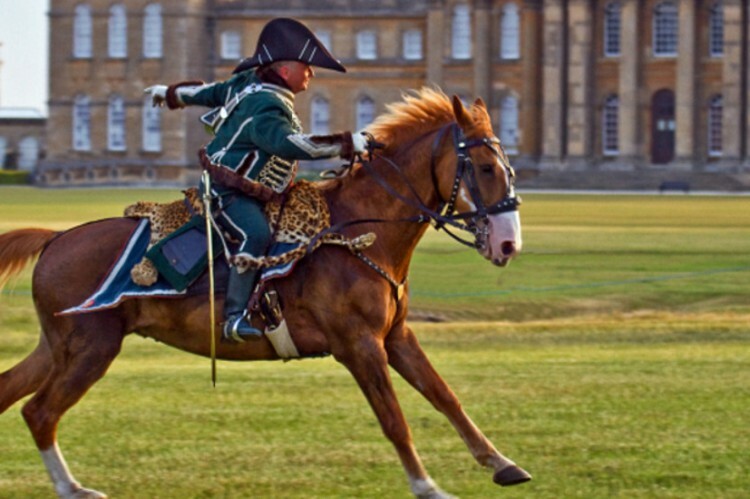 Sussex Yeomanry members have taken part in the cavalry displays (under the banner of Crown & Empire) for in excess of 12 years. 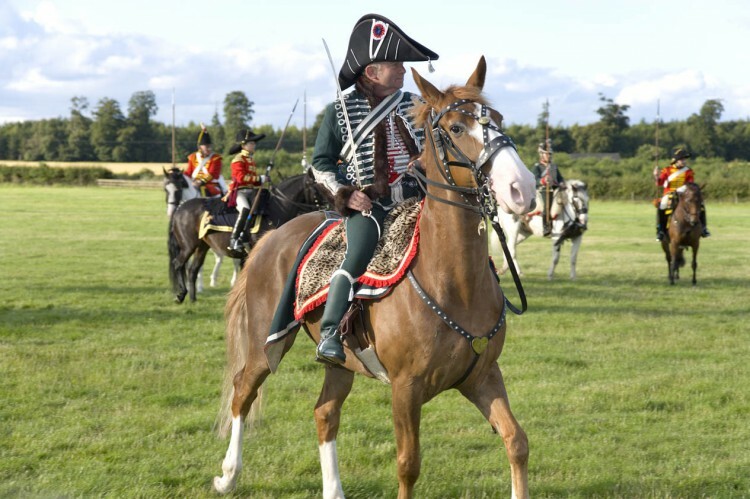 This is a video of the cavalry musical ride as performed at the Hatfield Battle Prom concert 2013. The lead riders as well as certain other participants are members of Sussex Yeomanry. As did the Yeomanry regiments of yesteryear, our Group puts great store in training. Think of the 8 P’s – Proper Planning and Preparation Prevents Piss Poor Pathetic Performance! 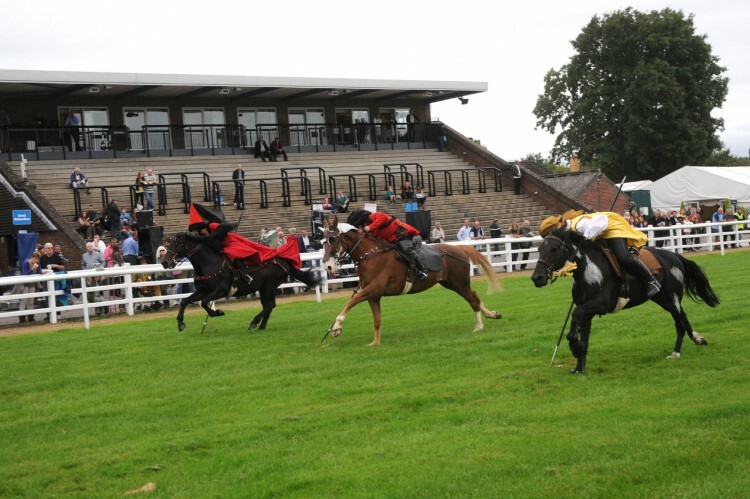 Our training encompasses not only the horse and rider combination but also ground crew. People who are our ground crew are essential for training days, shows and demonstrations. Nothing can realistically happen without them. It is not enough to enlist someone off the street for the day. The people on the ground need to know what is happening. This helps to keep not only them (personally) safe but also the public and the horses and riders. It also enhances performance and presentation. Our training encompasses general riding skills (i.e. flatwork, grid work, jumping, etc.) as well as the skills required in order to safely perform the many disciplines that fall within the general term of ‘mounted skill-at-arms’. We work with owner/riders. It is very difficult to train a rider in the many disciplines that are necessary to be part of our group if they do not own and ride their own horse regularly as they are unable to go home and practice. To train a horse that does not get consistent work from one rider is not as satisfactory as working with a horse that is in private ownership. 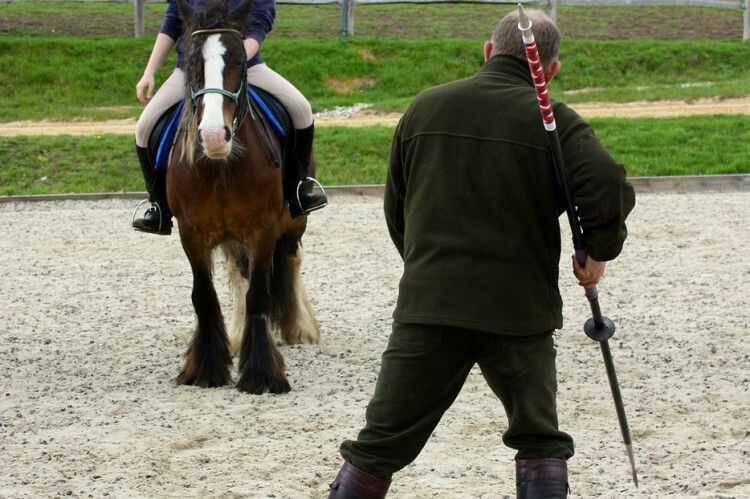 Our training is carried out in Sussex by people who are knowledgeable and experienced horsemen/women. 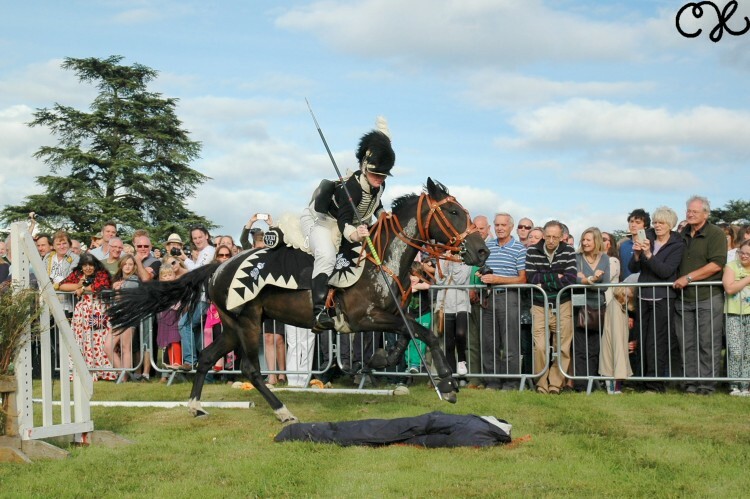 They are also knowledgeable and experienced in the safe handling of various weapons on horseback and the disciplines that involve the use of such weapons. Over a period of time we will add further photos and articles to this section that will cover different aspects of our training. Meanwhile, if you have any questions, please make contact with us. In the Medieval period, jousting tournaments were held not only for sport and entertainment but also to keep horses and men trained and ready for war. The tournaments involved not only jousting but also exercises that do not involve the use of armour. Sussex Yeomanry as a Group tries to give a flavour and feeling for the type of exercises that Medieval men on horseback took part in which involved the use of the quintain, lances, swords and daggers. Hunting was also good training for war and some of the Group’s demonstrations are based on the horse and weapons-handling skills needed for hunting. We have a gallery showing some of skills we demonstrate together with a selection of our costumes. Oscar is owned by John Dudeney, is a 16.2hh, 19-year-old chestnut gelding Gelderlander. He was bought as a 4-year-old from that well-known Irish dealer based in Sussex – Donal Barnwell. In his early years, Oscar was a BHS novice eventer. He was not a classic event horse but his long strides and big bold jump made up for that! When John’s daughter went to university, Oscar was introduced to Mounted Skill-at-Arms. This he took to very well – despite his size. He has taken part in numerous International SAA competitions in the UK and Holland. In the Spring of 2015 he will be going to Germany to take part in the German Cavalry Championships in Gotha. 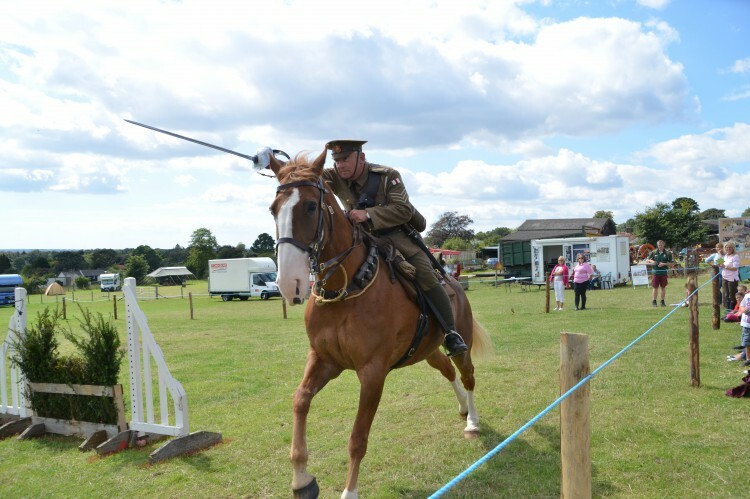 Oscar has also taken part in Skill-at-Arms demonstrations and the musical ride at Battle Proms concerts for many years under the umbrella of Crown & Empire. In general, Oscar is a very gentle horse. However, he is not keen on being clipped, having his teeth done – or camels! He is very fond of carrots, apples and having his back rubbed! The Battle Proms are an exciting yet informal open air picnic concerts to which people take their own food and picnic equipment and create their own space in the auditorium. The concerts have been staged since 1997 and provide an evening of exceptional entertainment that encompasses sublime music, stunningly choreographed aerial displays, thunderous cannon fire, dramatic cavalry displays and fantastic fireworks. 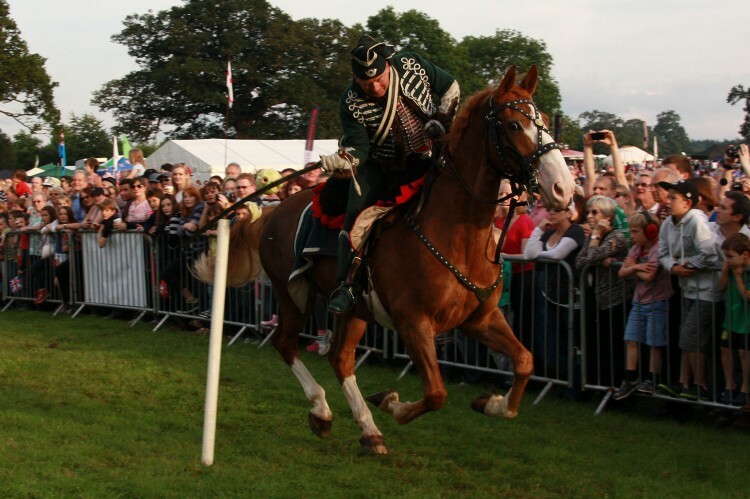 Sussex Yeomanry members have taken part in the cavalry displays (under the banner of Crown & Empire) for in excess of 12 years.